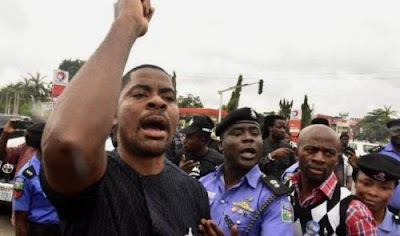 Human rights groups and a lawyer have condemned the arrest and detention of Deji Adeyanju, a political activist, and two others, by the police. Mr Adeyanju, the convener of Concerned Nigerians, was arrested on Wednesday morning at a protest tagged ‘Police Are Not Politicians, Save Our Democracy’ at the Police Force headquarters in Abuja. He was subsequently arraigned before a Chief Magistrate’s Court on Wednesday afternoon. The judge, Aliyu Kagargo, admitted Mr Adeyanju, Daniel Abobama and Boma Williams, the two others arrested with him, to bail. They were to each provide sureties that included a level-14 civil servant, a businessman with N20 million bond. But failure to immediately meet the bail terms allowed correctional officers to keep the three at the Keffi Prisons, about 40 minutes drive from Abuja. But Ariyo-Dare Atoye, a long-time associate of Mr Adeyanju, told Premium Times the leader of Concerned Nigerians and his comrades met their bail conditions as of Thursday afternoon, but the magistrate was unavailable to sign the papers for their release from jail. They are yet to be released despite perfecting their bail conditions, amidst allegations the police plan to file fresh charges. The Paradigm Initiative of Nigeria (PIN) in a statement signed by its communications officer, Sodiq Alabi, said every citizen is entitled to freedom of speech. The group also debunked the police defence that the activists’ actions were criminally defamatory. ”We do not agree with this position. Controversial or dissenting opinions do not automatically qualify as hate speech or defamation – and free speech and demonstration are the entitlement of every citizen of a democratic state,” it said. Also, the director of the Centre for Democracy and Development (CDD), Idayat Hassan, said the Buhari administration “has had a bad record on human rights since it came to power in 2015”. The director also said the civic space in the country is becoming more restricted “as the nation approaches the 2019 general election”. ”Abiri (recently released reporter) was the last one, now again Deji Adeyanju under lock of this administration. It means nobody is safe including me,” she said. The national coordinator of the Education Rights Campaign (ERC), Hassan Taiwo, also weighed in. ”I condemn it and it is a clear sign of developing dictatorship that somebody simply trying to express his democratic right to freedom of expression and association to call on the Nigerian police to be impartial in the coming election is now arrested by the same police,” the official said. He said the government’s slide to repression was making it impossible for Nigerian to freely protest even on social media. Also, Inibehe Effiong, a lawyer, in a telephone interview with Premium Times on Sunday condemned the detention of the activist. He said the fundamental right of Nigerians to freedom of expression as guaranteed under Section 39 of the Constitution had been violated in Mr Adeyanju’s case. He also said ‘while people should be held accountable for their statements on social media, they (police) should not use that as an excuse to violate the fundamental rights of Nigerians. He said the government should focus on clearing itself of allegations of corruption levelled against top officials of the administration than hounding perceived enemies. ”These, in my opinion, are more serious issues than the alleged insulting statements credited to Deji Adeyanju,” he added.